Not to mention worries about messing up her pretty dress! I love a photo that tells a story. And I love those cowboy boots! 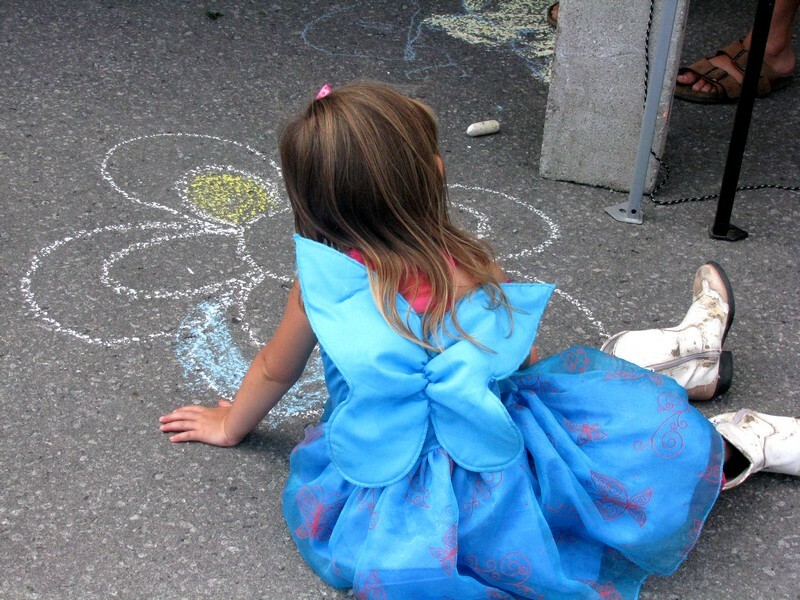 Satin Faerie wings and gown of richest blues and … chalk to make art everywhere, anywhere. Great shot, Carin! Chalk art, yes! There isn’t enough of it in the world. Oh how lovely — the blue butterfly dress, the white boots — the rapt attention of the artist who is not feared to “get down and dirty” with her art! And the composition of the whole, so satisfying and sweet. What a cute photo heheh! I especially like that you captured her so engrossed in art making. ‘Engrossed’, yes. I like how that comes through. Thank you. How delightful Carin! The little girl’s satiny blue dress with the white cowboy boots are such a wonderful statement. I bet there is personality plus contained in that little one! And I love that she is completely unaware of the photographer (and the viewer) looking over her shoulder. The boots make the picture for me. And that whoever helped get her into her wings didn’t also tell her to stand straight and mind her dress. So perfect! I was going to ask if you just happened upon her or if it was a pose but have just read the other comments. It’s even better knowing she was just there, engrossed and oblivious. I’d seen her earlier, skipping and leaping about. Very much in her own little world. Can’t imagine her being bored.